Bright-Eyed Scout is a 4 Mana Cost Epic Neutral Minion card from the Journey to Un'Goro set! Hmm.. I’m thinking Astral druid? I think this is an underestimated card. 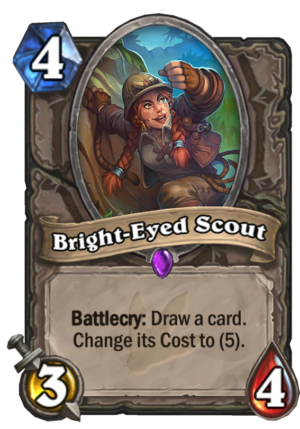 It draws a card which always is good and – if placed on turn 4 – almost always allows you to play a card on turn 5. 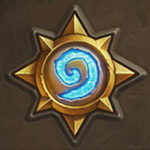 It doesn’t say “The next card you draw” – since you draw a card – and in late game based decks with many high cost cards this could definetely be an asset. Based on the new duid quest it also has synnergy there. So a more RNG-based Naga Siren? It can make or break the next card you draw, and it can literally win or lose you the game in certain circumstances. Of course it gives you something to play on next turn if you play this on 4. I guess it’s alright in Ramp/Y’Shaarj druid, which isn’t exactly a meta deck right now. Though it really is string with the new Druid Legendary! Jokes aside, mediocre dust-filler, unless someone can create a consistent deck that can exploit this ability. How are you even supposed to use this? Amazing synergy with Hemet, Jungle Hunter.